Being an only child living on a farm was an education in itself. I was deeply loved and well cared for by my parents, but I was lonely. There were times when I was called a ‘spoiled princess’ that never sounded like a compliment to me, or a ‘spoiled brat’, depending on the circumstances. I longed to have a brother or sister to play with. Our closest neighbors were two miles away, and their four boys were all older than me. My dad was a fun guy and took the time to be with me whenever possible. He had been a cattle driver in the Cypress Hills before he married my Mom, and dreamt of some day having his own ranch, but it never happened. His one treasure from his days as a cattle driver was his beloved horse. ‘Brownie’ was a one-man horse, but occasionally Dad would take me for rides on Brownie. We lived on a mixed farm, and Dad’s work was seeding and harvesting fields of grain, milking cows, and tending to the work horses. My mother raised chickens, some geese, and a few turkeys. She enjoyed a large garden, and preserved fruits and vegetables, jams and jellies, and made homemade sausage to enjoy in the winter months. She too worked hard so that our family could be as self-sufficient as possible. I did have some playmates. ‘Spot’ was my dog and constant companion. He would even let me ride him around the yard until Dad told me that I should learn to ride a pony because I was getting too big to ride Spot. I also loved to play in the chicken coupe. Some of the chickens became so tame that when I entered their area, they would flap their wings and nestle down so that I could pick them up. I loved to carry one around the yard. 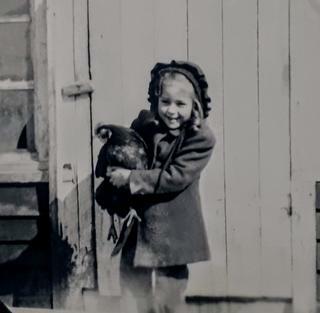 This is a picture of me with my chicken, taken in 1945. Our post office was at Grainger, Alberta, a small hamlet several miles from home. There were three grain elevators, a railroad station, two houses, and Mike’s, a General Store and Post Office, with one manual gas pump, and Mike’s living quarters. I knew that when we stopped there, Mike would have a candy sucker for me as a treat. I didn’t start school until 1947, when I was seven years old. Berkley, a one-room school for nine grades, was about six miles from home. In warm weather, we traveled by wagon, and in the winter by sleigh or stone boat, pulled by Dad’s team of workhorses. Often times, the neighbor’s boys traveled with us, especially when the winter weather was severe. There were some days when we couldn’t get to school because there was so much snow. Even the horses couldn’t get through the deep snow. Dad tried to keep the road clear so that at least we could get to church on Sundays, but it was very hard because he had to shovel the snow by hand. It was a combination of these circumstances that helped my parents decide to move to the city the next year. A neighbor agreed to work our farm on a lease basis, and my dad learned to be a carpenter. Life took on a whole new look… new home, new school, new church, new job …and lots of friends! This “only” child was very happy! I enjoyed your blog. Thank you, Mona. I have never done one before. Maybe I should try it sometime when the computer is behaving. I find I can remember so much from my childhood now I am old. I have clear memories from the early 40s onward as Britain got in the war shortly after I was born. Someone might be interested. It would have been my mother’s 114 birthday today. Still miss her. Enjoyed your sharing this. I am a twin (sister), being younger by 3 minutes. We raised cattle, pigs, chickens, and other animals on a farm. We lived in town and the farm was about 10 miles N. Remember many days going there after school for chores. I look back now and realize it instilled a wonderful work ethic in both my sister and myself. Something we are truly seeing a lack of in today’s world. Life was so much simpler then. Thanks for telling us about your childhood on a farm, Mona. It was interesting to hear about the 'old days'. My generation had school buses so we never worried about getting to school. I had to smile: when I visited my grandparents' farm, the chickens chased me, so I wasn't thrilled about them! But we kids did learn to 'slop the pigs' & milk the cows (I wasn't very good at that!). And as I mentioned in a blog, I was horrified to watch Grandma kill a chicken for dinner--which I couldn't make myself eat. I was happy to be a 'townie'. Nice interesting story. All turned out well in the end. Thanks for sharing..